I struggled a bit to name these. 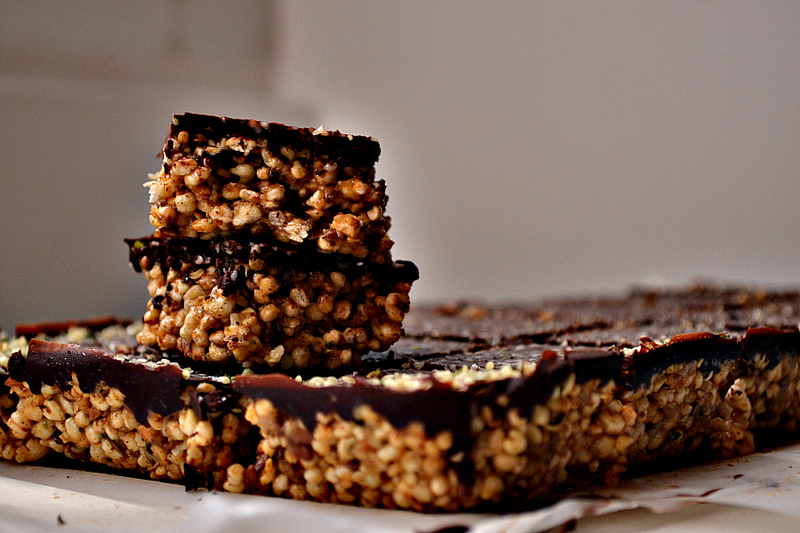 Chocolate Covered Maple Tahini Cereal Bars with Hemp Hearts and Flaxseeds seemed like too long of a name. Also, they’re not quite bars, they’re actually squares, but bars gets the message across better, so that word stayed. I setteld on Cereal Bars with Hemp, Flax & Chocolate because in the end what’s more search-able than chocolate? Yes, as much as I do this for love, I do want people to find and read my posts and recipes. Did I mention there’s also tahini and maple syrup in there? Yup, true story folks. Match made in cereal bar heaven. This was one of those recipes that didn’t involve a lot of forethought and pre-planning . Fresh out of snackbars, my all time favourite portable snack food, I reached inside the pantry and pulled out a couple of bags of puffed cereal, millet and quinoa to be exact. I always keep a variety on hand because you never know when puffed grains might come in handy. Exhibit A, B and C should illustrate my point nicely. I then opened the fridge and pulled out the flax and hemp seeds, which I always keep refrigerated by the way to prevent rancidity. Next was figuring out how to stick it all together and what goes better than maple syrup and tahini really? Dried fruit puree is also a beautiful thing but I was being lazy and didn’t feel like pulling out the food processor. I added some brown rice malt syrup for some extra glue factor and some vanilla for good measure. Once it was all mixed and spread into the dish to set, I thought…hmmm…what if I covered these in melted chocolate. And there you have it folks, Chocolate Covered Maple Tahini Cereal Bars with Hemp Hearts and Flaxseeds. 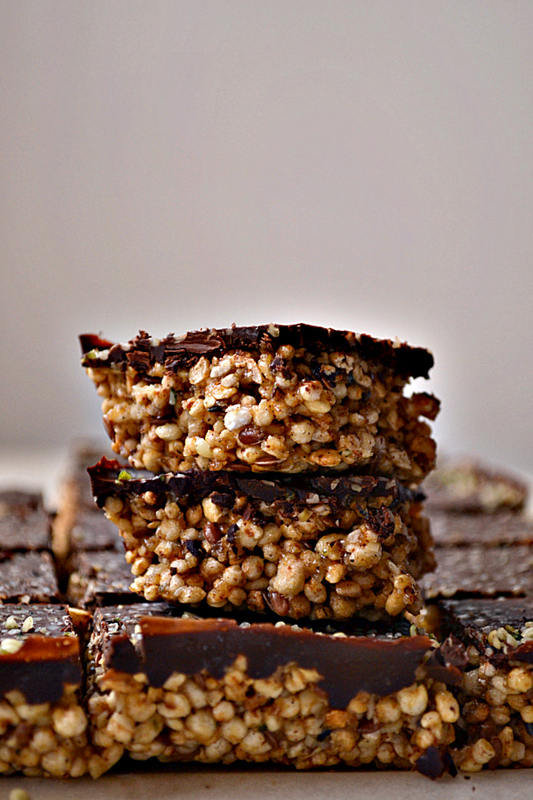 While they’re more on the decadent and indulgent side of things, compared to my usual snack bar recipes, they’re packed with all sorts of goodness nonetheless. Hemp and flaxseeds are excellent sources of essential fatty acids, dietary fiber and protein. As far as seeds go, they’re both pretty heroic in terms of health and nutrition benefits with some differences. Flaxseeds have more omega 3 fatty acids and higher fiber content while hemp hearts contain more omega 6 fatty acids and a higher protein content. Hemp hearts are a good source of magnesium, manganese, phosphorous, iron and zinc. They help fight inflammation, promote muscle relaxation, support heart health and the immune system. They are also a complete protein source in that they contain all 9 essential amino acids that our bodies can’t produce, making them a key plant source protein for those who don’t eat animal products. Flaxseeds are a good source of vitamin B1, magnesium, manganese, copper, phosphorous and selenium and like hemp hearts, also prevent inflammation and support heart health. A key additional benefit of flaxseeds is that of digestive support due to their water soluble gel like fiber content that helps regulate digestion and improve nutrient absorption in the small intestines (not to mention makes them a perfect egg replacer for binding baked goods) Flaxseeds also contain lignans, compounds that provide fiber like benefits and antioxidant support. On a last note, while hemp hearts are soft and creamy, flaxseeds are tough and more difficult to chew so it’s best to crush or grind them to improve their digestibility, otherwise they will pass through the intestinal tract undigested and you won’t benefit from their full nutritional value. Mix puffed grain, hemp hearts, flaxseeds and vanilla in a large mixing bowl. Pour tahini, maple syrup and brown rice malk syrup over top and stir to combine until a compact sticky mixture forms. Press firmly into a parchment paper lined baking dish (I used an 11×17 size glass Pyrex dish) and place in the freezer to firm up. Meanwhile, chop the dark chocolate bar into small pieces and add it to a non plastic heat resistant blow. Place bowl over a small pot of boiling water (bain marie) and allow the chocolate to melt, whisking to make sure it has all melted and no small chunks remain. Remove from heat. Remove the dish from the freezer and pour the melted chocolate over the cereal and seed mixture, covering the top evenly and making sure the chocolate surface is smooth. Sprinkle with hemp hearts and return to the freezer to set for at least 1 hour. Remove from the freezer and slice into 18 pieces (this may be different if you use a different size baking dish or if you prefer smaller or larger slices). Store in the freezer in an airtight container between layers of parchment paper to prevent them from sticking together or to the container. 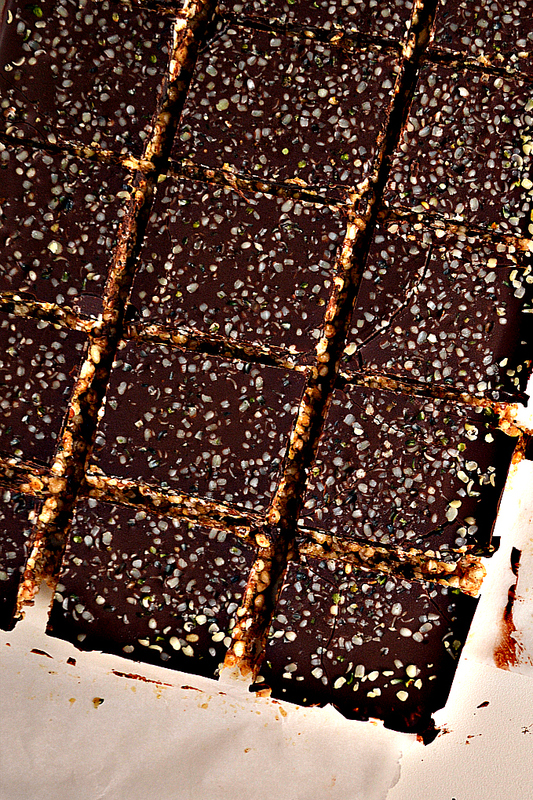 Serve straight out of the freezer for an ice cream bar like treat or let warm to room temperature for a chewy treat. These look so good Nissrine, I’m drooling! I love the crunchy aspect and I love that there is of course tahini and maple syrup, 2 of my favorite ingredients!! I have never tried hemp before and I can’t have millet. Would puffed brown rice cereal work? I have tons of that! Awesome recipe!